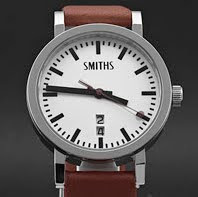 HOROLOGY CRAZY: New Smiths Watch? This was spotted over at the Timefactors website. If you look at the flash animation on the welcome page, you can see the watch. The watch looks like it has the Bauhaus design concept with a large date (?) at the 6 o'clock position. As you know, Timefactors owns the Smiths name. Will monitor this and update once there is more news.